If you happen to be involved in a large business, that includes a list of cool food items, then the affordable Tor-Rey Refrigeration is what you need. The refrigerators allow you to keep the food cold. The spacious refrigerators are available in different sizes to suit each business need. The unit is fitted with double tempered glass that prevents warm air leaking in or the cold air letting out. The self- contained affordable Tor-Rey Refrigeration is the perfect choice when one is looking at saving energy, as the refrigerator lets the inner unit to remain colder for longer hours with help from the double tempered glass. The affordable Tor-Rey Refrigeration is made out of very high-quality materials to ensure food has a longer shelf life. 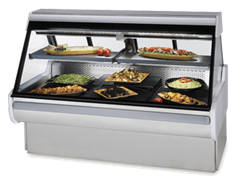 The deli case of the brand is designed to showcase products in small or restricted space. Each of the refrigerators includes the double pane panoramic front glass that gives perfect visibility to your products. The double pane glass even stops condensation to form inside the case. Moreover, the refrigerators come with Electronics Digital Controller that provides three functional modes to balance out the performance of the equipment. The intelligent lighting system enables the user to set the controller in turn off mode to switch off the lights without stopping the equipment from functioning. The switch on mode lets the interior lights to continue functioning. The system is also equipped with an Auto mode that includes a light sensor to detect the surrounding light. The business can set the controller preference and save the setting to reduce energy consumption. All refrigeration units are equipped with LED lights to ensure brighter display of products while lowering your power consumption. The use of LED lighting also leads to the consistent highlight of the product attributes. The refrigerators put special emphasis on efficient energy consumption and for this reason, it comes with a controller. The temperature of the unit can be set between 31 and 69oF to make your unit more efficient and keep your food fresh for longer. In refrigerators the defrost cycle needs to be strong to avoid ice- buildup. The Tor-rey refrigerators temperature controller, runs automatic defrost cycle every 60 minutes of the compressor working for 6 minutes. This ensures the evaporating coils are devoid of any ice-buildup. The units also come with adjustable steel shelves to give a perfect look to your products. The steel shelves can be adjusted to three distinct positions to get the optimum display of products. The shelves are low on maintenance, as it can be cleaned very easily. In order to give a proper maintenance to the product, the refrigerator has been designed with detachable front covers that allow uncomplicated access to the condensing unit for its proper cleaning and maintenance. Regular maintenance ensures the product works at its optimum and remains durable. Additionally, the refrigerator is fitted with gravity coil system which means its refrigeration coil rests at the top of the cabinet, this leads to the cool air dropping down over the food. The mechanism prevents the product stored inside from drying out and retains its originality.